Warning! Warning! Beginner’s bravado is contagious. Very contagious! You see, I’m not the only one who has caught beginner’s bravado. It’s now spread to my husband and the kids. That was music to my ears!! It might not be true but I’ve never let truth get in the way of a good story and it just sounded so good… concert violinist! I can already see my name up in lights, even though I have barely tapped into my 10,000 hours of required practice. Becoming a concert violinist takes a lot more than dreaming! That said, there’s nothing wrong with pretend. If we didn’t pretend, we’d never dream, set goals or even try to extend ourselves. Geoff was full of wisdom this morning. In addition to calling me a concert violinist, he also said that I was a step closer to finding my calling or direction in life…being a violinist and not a rally navigator! 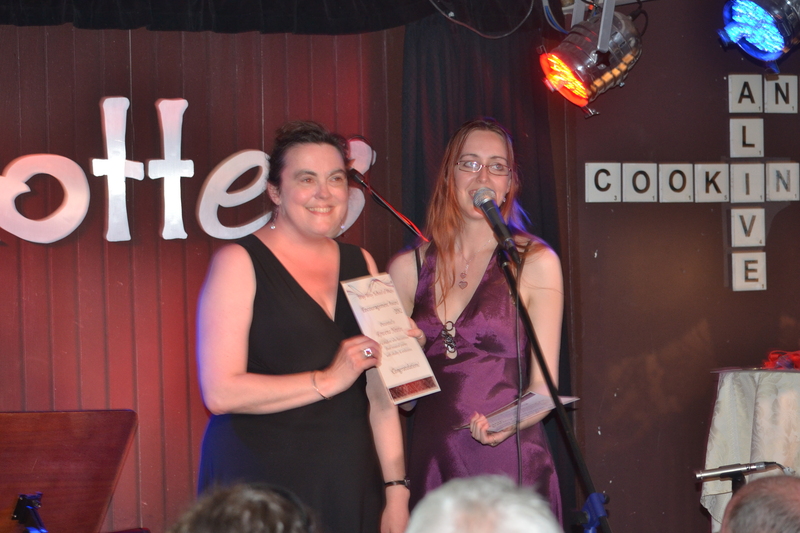 You might well wonder what being a rally navigator has to do with performing at Lizotte’s and playing my violin. That’s quite a valid question. Geoff in his wisdom arranged for Mum to drive me to the concert so I could give her directions. Mum lives in Sydney and doesn’t know the area but I am directionally challenged and get lost in my own backyard. Moreover, I was 200% focused on the concert. So having me giving Mum directions was destined to fail!! Anyway, Mum and I had barely driven around the corner when I forgot to tell her to turn right at the huge, unmissable roundabout. Then, she didn’t want to turn right onto a major road, which is fair enough so we’re heading down all these rabbit warrens in the back of Woy Woy trying to get back to the bigger than Ben Her roundabout that I’d forgotten to mention. Not unsurprisingly Geoff, who had left after us thanks to Mister rolling around in the grass just prior to leaving, arrived at Lizotte’s well before us. In fact, he was called me on the mobile poised to send out a search party. By the time we arrived, Geoff and the kids were standing by the road like a bunch of balloons tied to a letterbox for a party. There was no doubt that this was Lizotte’s. In some ways, all our driving dramas were a relief. You just know something’s going to go wrong so once it’s happened, you can relax. Enjoy yourself! You’ve had your drama. It’s all going to be fine from now on. 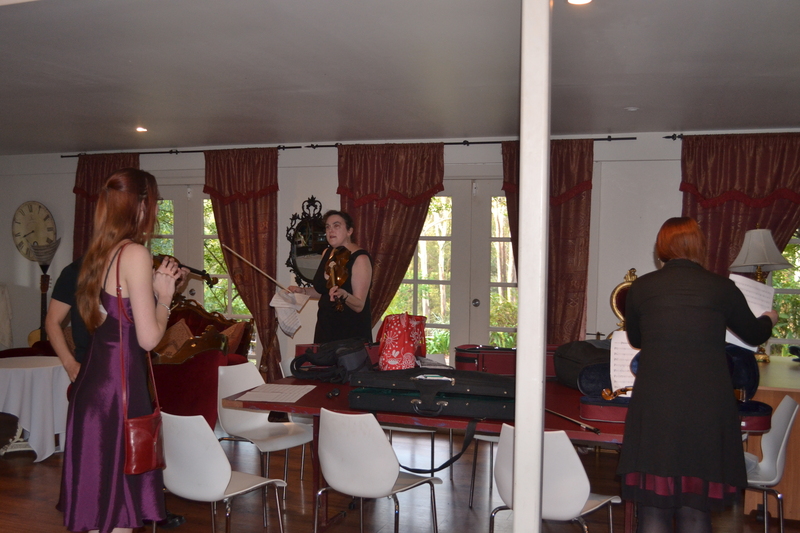 Upon our eventual arrival, I was off downstairs to the Green Room to warm up and rehearse. The Green Room was actually red with plush, velvet lounges you could just sink into and relax, if you weren’t about to go on stage. 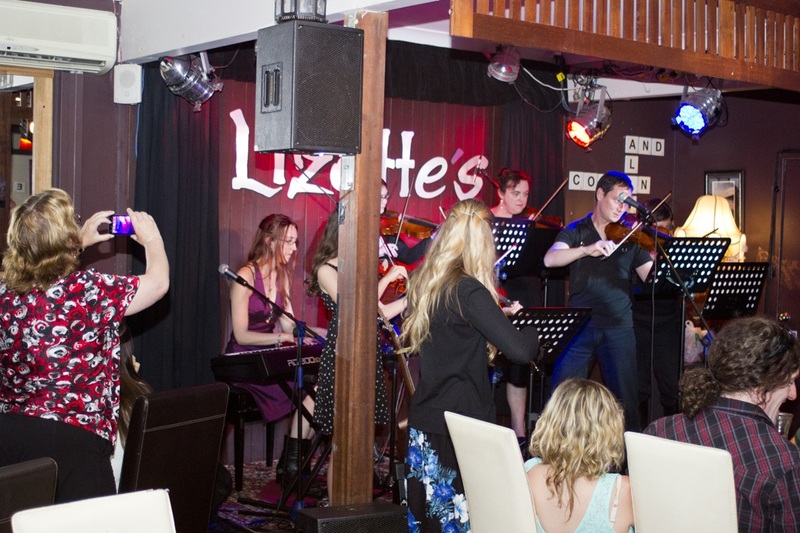 I loved the ambience and couldn’t help feeling connected to all those famous musicians who have performed at Lizotte’s before me…the ghosts of musicians past! 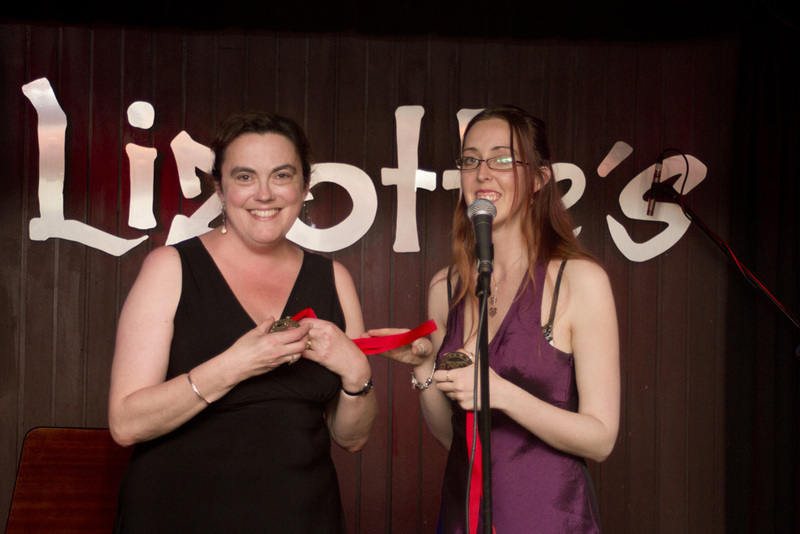 It felt so wonderful just to be there and I hadn’t even been on stage. This was serious musician territory and I was part of it…a very small and very green part of it but still a part of it all the same. If you aim low, you stay low. If you aim for the sky, you might even fly or at least hitch a lift with Qantas! Yet, at this stage of the game, I couldn’t get too far ahead of myself. As I explained in my last post, violins can be very temperamental and I wanted to give myself the very best chance of success. I needed to warm up properly and really, seriously etch all those notes into my brain just to be sure. Lizotte’s is a dinner venue so the audience was all seated around tables and there’s a small, intimate stage. I believe the stage was up the front but it might have been up the back. That depends on your perspective. Geoff mentioned something to me about kitchens being about the back, which means the stage was out the front. That does make sense. Remember! I am directionally challenged!! All too soon it was time to perform and after all those months of serious practice and thinking about something distant, remote and in the future, this was it. It was actually happening. I was about to play my violin for the first time ever in public… my debut! We walked on stage. I wasn’t nervous about the performance. I was carrying my music stand and I was seriously concerned about tripping over and I had this awful sense of Murphy’s Law. That this would be just the time my ankle flipped over and I’d fall crashing to the ground. Remember I have hospital-strength muscle weakness. I’m not just talking about fear. We’re talking legitimate physical restrictions. I have a disabled parking permit and you don’t find them in a cereal packet. However, everything went smoothly. I did it! I really can’t tell you how the concert went. I was too busy performing. But we did get some very positive feedback. Our teacher was glowing with praise and had that look of a proud mother hen. She even called us “musicians” and has mentioned future performances at upcoming Christmas carols. A friend of mine also asked me how long I’d been playing with the ensemble, giving the impression that she’d thought we’d been around for awhile and weren’t just rank beginners. Geoff said “we had a good cohesive performance”. We are now looking at performing at some Christmas carols but as I was told today, it’s only six weeks to Christmas. Christmas carols are sounding like a lot of hard work but I love it, love it, love it. Bring it on! Beginner’s bravado strikes again! I walked off stage and sat down with Geoff, Mum and the kids. Turned out that while I was waiting to go on stage, they had presented the junior awards and our son had received the Enthusiasm Award. This included having good behaviour so we were really stoked. 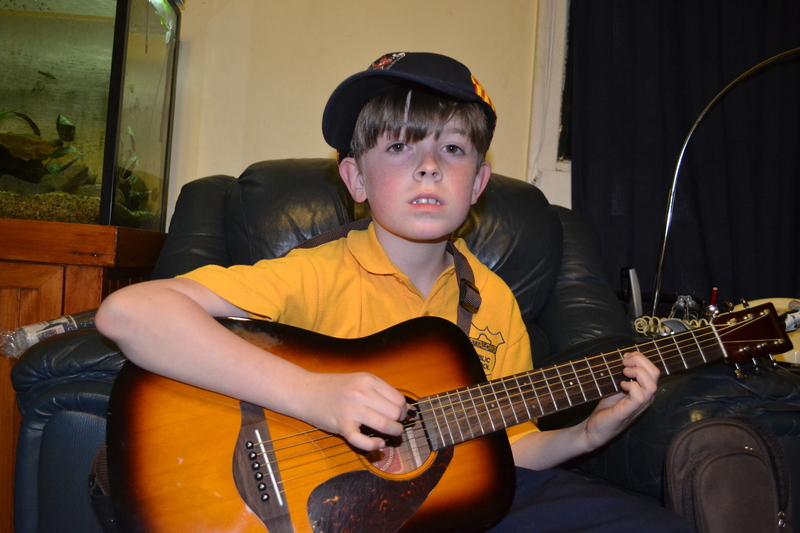 He has only been learning the guitar for just over a term and is still at that awkward beginner stage trying to get his fingers to change chords. It was a bit too premature for him to perform at the concert but he was very proud of his award. I won the Encouragement Medal, which was very encouraging. I felt like an Olympian! Tonight was certainly life lesson time for our daughter. She wanted her own medal and wasn’t happy when she missed out. I’m sure it really grated on her that her brother won an award and then Mummy won the medal. She has been telling me how to play the violin since she started up again last week and when she’s not getting upset about how badly she’s playing, I think she does fancy herself as a good musician or that she’s at least better than the rest of us! I couldn’t resist pointing out to her that since she has only attended one lesson since third term, she didn’t deserve one. It looks like I’ve finally found my motivation tool. I think this might just be the rocket she needed! I’ve been walking round all day today like the cat which swallowed the proverbial canary. I was also going to say that I have the biggest smile stuck on my face but it’s not just stuck on. It penetrates my soul. I feel amazingly good!! 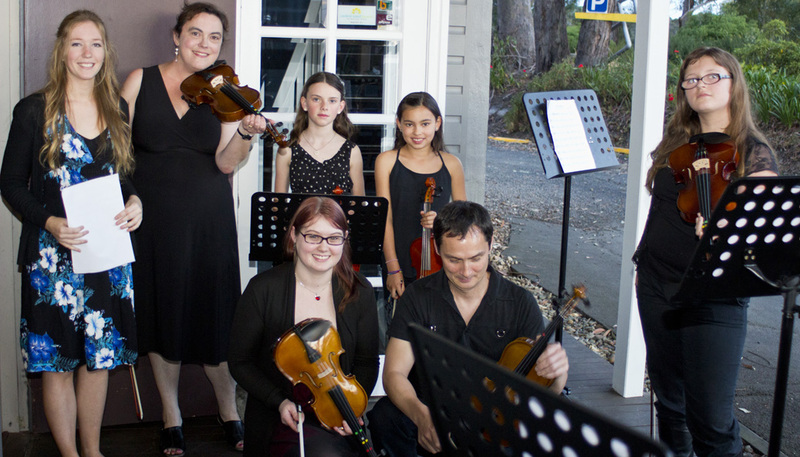 It’s quite amazing to think that only nine months ago to the day, I wandered into the music school for my daughter’s first violin lesson and was invited to sit in and to help her at home. I had no thoughts of learning the violin myself. We didn’t even have a violin for Miss at the time. I started out on Geoff’s grandfather’s violin, which came out with him from England back in 1890. WE then found a cheap Chinese violin on eBay, which wasn’t too bad and now I’ve graduated to the Student Stentor II. It’s still not a Stradivarius but she’s mine! I have found this whole journey so encouraging. So often as a mother, you think about all the losses you ‘ve had since you’ve had kids and it can be easy to overlook the ways in which being a parent has actually extended your horizons. How being a parent has expanded us beyond our wildest dreams! When I took up the violin, I was barely out of the lung crisis and my auto-immune disease has been flaring and for much of this year. I have taken up the violin while sort of fighting for my life, which does seem a little crazy at times but I have no doubts that my violin is really helping me to get through it all. She is my soul mate! Speaking of twists and turns, I can’t help wondering whether the next time I head off to perform at Lizotte’s, I might turn right instead of left and somehow end up at the Sydney Opera House by mistake. Now, wouldn’t that be a hoot? Perhaps, you could join me! There’s beginner’s luck but have you ever considered “Beginner’s Bravado”? Beginner’s bravado is when the beginner’s enthusiasm gets way ahead of their abilities. It sees toddlers climbing Mt Everest, even though they’re only just learning to walk. It can also make a beginner feel like a violinist, a maestro, when they still have dots stuck on their violin and can’t even play fourth finger let alone vibrato. Beginner’s Bravado helps you rise so far above your station, that you become airborne and much to even your own amazement, you might even fly! As much as Beginner’s Bravado can get you off the ground, it can also land you in deep water. One minute, it’s all blue skies. Then, you get caught in a head wind and before you know it, you’re half way to New Zealand and you can’t get back. That’s what happened to me, my violin and the end of year concert. You see, because I thought I could play Edelweiss, I sheepishly asked my violin teacher whether I could perform at the end of year concert. I have played the piano at such concerts when I was a kid and it didn’t seem like such a big deal. My teacher was quite encouraging and then she had all sorts of ideas. She asked whether I wanted to perform by myself or in a group. Despite my prima donna tendencies, playing in a group sounded like the sensible option! She put together a medley of The Rose, Amazing Grace and Edelweiss and it all seemed fabulous. I was sold. I should just let you in on a little secret. I have only been playing the violin for nine months minus a day. Moreover, taking up the violin wasn’t a conscious choice or a matter of crossing off something from my bucket list. I had learnt the violin for a couple of terms as a kid and as far as I was concerned, that was it. I’d learnt the piano but I wasn’t really into music. Taking up the violin was all my daughter’s idea and I was just her taxi. I sat in on her lessons and helped her at home. We practiced together and slowly but surely, I fell in love with the violin but my daughter pulled out for awhile. She just couldn’t cope with all the screeching. She has sensitive ears. After a few prima donna meltdowns on her part, I decided to continue with the lessons without her, not really sure where it was all heading. I was hoping that if I continued and demonstrated that you really do improve with practice, that she would come back on board. I knew how much she actually loved the violin. Music is her thing…not mine! So I guess you could say I picked up the violin on the rebound or even second-hand. Back to the violin concert. A few weeks later, my violin teacher was looking hesitant. She was concerned that we wouldn’t be ready in time. I heard her concerns but you know how it is when you are new at something and you think you know it but you don’t and me being me, I was quite dismissive. We still had a couple of months to go. How hard could it be? Once again, the beginner’s bravado had kicked in. I reassured her that everything would be fine…just fine!! We could do it!! I have now made a mental note to self that the next time someone with more experience has concerns, I will take them more seriously. There is a problem. It may not be a big one but I do need to take it seriously. There might be something I don’t know about which needs to be considered, not ignored. At the same time I was being positive and encouraging, my violin was being quite difficult. I was practicing for at least 30 minutes to an hour per day and yet I still wasn’t improving. If anything, I sounded worse. I was constantly playing two strings at once and my violin was screeching like an out of tune cockatoo and was really sounding revolting. As time went by and the concert date was getting closer and closer, I was beginning to worry. What if I wasn’t ready on time? Meanwhile, I gained a new respect for the violin. Although I’d thought that playing on one string would be relatively easy, I have now realised that trying to play the violin is like trying to bake the perfect sponge cake. That just like sponge cakes, violins are very sensitive. The eggs need to be at room temperature and you must separate the yolks from the whites. You have to sift the flour 3 times to get the air into it and then add that essential pinch of salt. Then, once you finally get the mixture into the oven, you can’t open the door under any circumstances and have to tiptoe around the kitchen very carefully without any thumping or jumping. The same with the violin. If it’s going to be so impossible, maybe I should just go back to piano and pick up where I left off? It could be easier perhaps for me to learn the piano but the violin speaks to me. The piano does not or at least not in the same way! Besides, I’m not a quitter. I believe in the power of persistence even when the evidence is maybe even strongly stacked against me. I practiced more and more and more. They say practice makes perfect but what no one seems to tell you, is just how much practice it actually takes. It turns out that the magic figure is 10,000 hours of practice to become an expert in your field. I then calculated that if I practice for 1 hour per day, it would take me 27 years to become a maestro. That means, I would be 70 years old and well and truly retired by the time I was ready for Carnegie Hall. At two hours a day, success is almost achievable but that’s a serious commitment. I’d pretty much be living for my violin and I’m writer. That said, I’d hate to think how much time I waste each day and if I could possibly consolidate some of those lost minutes, then perhaps I could fit my two hours in without too much trouble. Perhaps, I could take my violin to the medical centre and practice while I’m waiting for the doctor or my blood test. I could practice while I’m telling the kids to get ready for the umpteenth time. I already practice while I’m cooking, waiting for something on the stove and while I’m waiting for my cup of tea to cool down. After all, you have to seize the moment…especially when a moment is all you have! In the meantime, it’s looking like a dawn performance on the steps of the Sydney Opera House and I’ll just have to hope that the security guard doesn’t call the Police! Yesterday, with just over 24 hours to go to the big concert, I pulled out my violin and panicked. Geoff and I had been away for the weekend at Jazz in the Vines in the Hunter Valley. This means I’d missed two days of violin practice. I wasn’t too concerned about this because I’d been practicing steadily and had felt I had finally cracked it. I was almost relaxed. However, when I started playing again yesterday, it sounded awful. It was playing two strings at once and the notes were ever so slightly out of tune but it very noticeable. It wasn’t good. I tell you, there is nothing quite like a jealous violin! I even wondered whether my violin had been secretly siphoned out some of the wine (perhaps a bit of Merlot as we slept) because my bow was having trouble playing in a straight line and was sliding all over the place. Fortunately, it turned out that my violin doesn’t hold a grudge because when I went to practice last night, it wasn’t too bad. It wasn’t perfect but it was a vast improvement. I’d also had a nanna nap in the afternoon so perhaps that helped. It’s now just four hours til the concert begins. I’m more excited than nervous. I really enjoy performing with the group and I really want to see how it all finally comes together. I have done my best to prepare and it all just boils down to that moment in time. How will it all come together? Will my violin be naughty or nice? This entry was posted in Uncategorized, Violin and tagged bucket list, challenge, music, performance, perseverance, practice, violin on October 30, 2012 by Rowena. A Poem- In Pursuit of the Nightingale. struggling to get off the ground. it hasn’t quite learned how to fly. I can’t find the nightingale. marked never to be released. It will never get out! so far away from me? I would even rip out my heart. Serve it up on a silver platter. the glimmer of a smile. so far beyond our wildest dreams! the cockatoos are all silent. the splendour of our song. This entry was posted in Poetry, Uncategorized, Violin and tagged acceptance, happiness, inspiration, love, music, nightingale, passion, soul, violin on October 30, 2012 by Rowena. It’s time we bring back the niceometer and value niceness, instead of celebrating the very worst of human behaviour! For some reason, being “nice” is now perceived as some kind of put down. Used to refer to someone who boring, bland or insipid, it’s used as a derogatory term – instead of something to be revered. I say we need to bring back “nice”. Resurrect it from the dead and all nice people should sport their niceness with pride. Nice needs to come out of the closet and strut its stuff. I know being nice probably sounds very Brady Bunch but what’s so wrong with caring about your fellow human being and developing a bit of character? Shouldn’t we be encouraging giving instead of taking? Building community? We had such a fabulous day and experienced the very best of human nice and kindness that I had to share it. 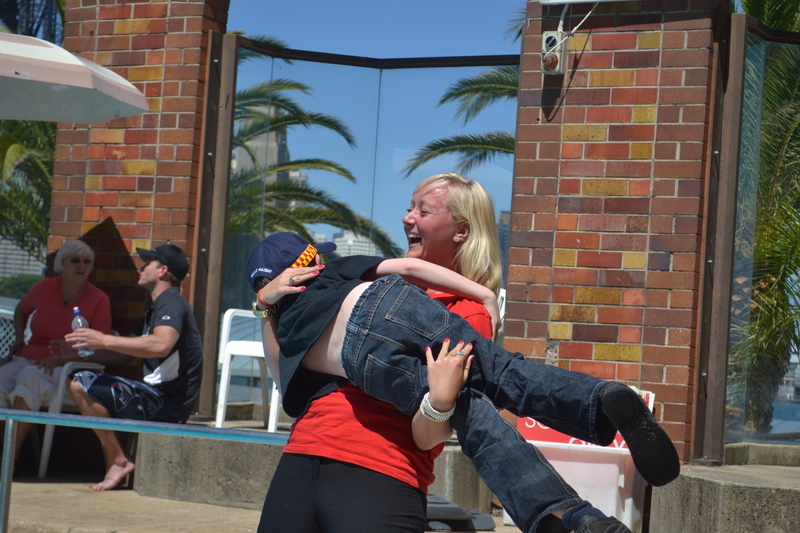 Here are a few vignettes from our Fill the Boot Day, which might just restore your faith in human kindness. I’ve listed them in chronological order as the day unfolded. 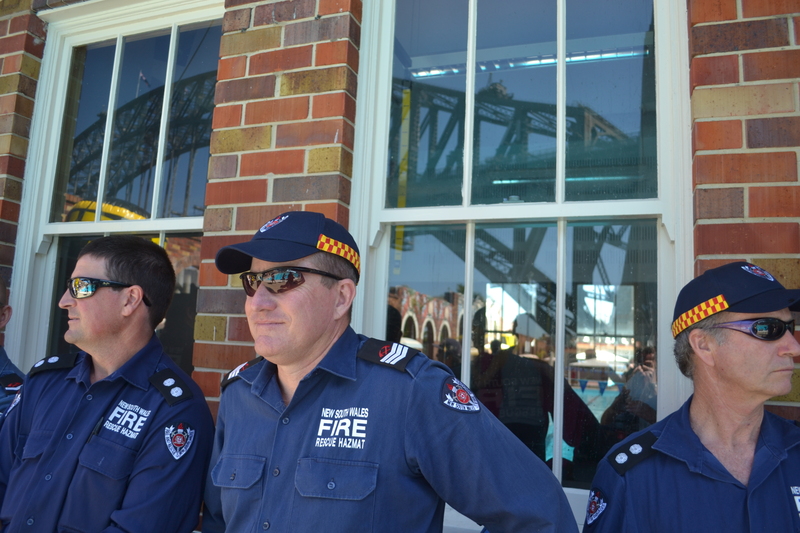 Firstly, there was the fundraising by the firies. Firies are wonderful people who put their lives on the line everyday to save others. Yet, they found the time and energy to get out there and raise money for us and I really appreciate it! They managed to raise $100,000.00 for the Muscular Dystrophy Foundation. Yippee! That’s a lot of chocolate… oops! I mean research! 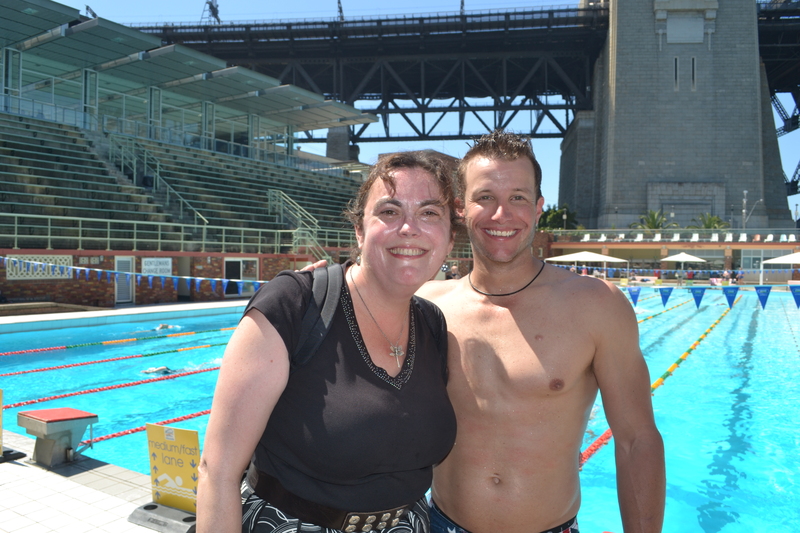 Secondly, we not only met Luke Jacobz, Host of the x Factor, he actually spent time with us – real time. I have to laugh because when I first met him, he was wearing an Olympic gold medal around his neck and I thought he was one the athletes. Go Ro! I have watched the x Factor but I don’t watch a lot of TV and I’m certainly no celebrity chaser. I honestly didn’t recognise him. Luke was genuinely very, very nice and one of those rare people who are very attentive and really listen to you. Mister and Luke had some very long discussions about something although none of us can quite remember what they talked about. I do remember Miss talking to him about her tooth falling out and how she’d found fairy dust on her hands the next morning along with a $5.00 note from the tooth fairy. As I said, Luke was very attentive and asked her questions and took a real, genuine interest. He wasn’t looking over his shoulder for someone more interesting to chat with. The kids really appreciated this. Not because he is the host of the X Factor but because he helped them feel special, loved and treasured. They were glowing. It really touched me to see them so happy. We have had some very tough times and it meant the world for me to see them smile and have so many deep belly laughs. Kags from MDNSW also did a pretty good job at making the kids laugh and feel special too. I’ve been asked when they’re going to see Kags again. Kags & Miss at the lunch. 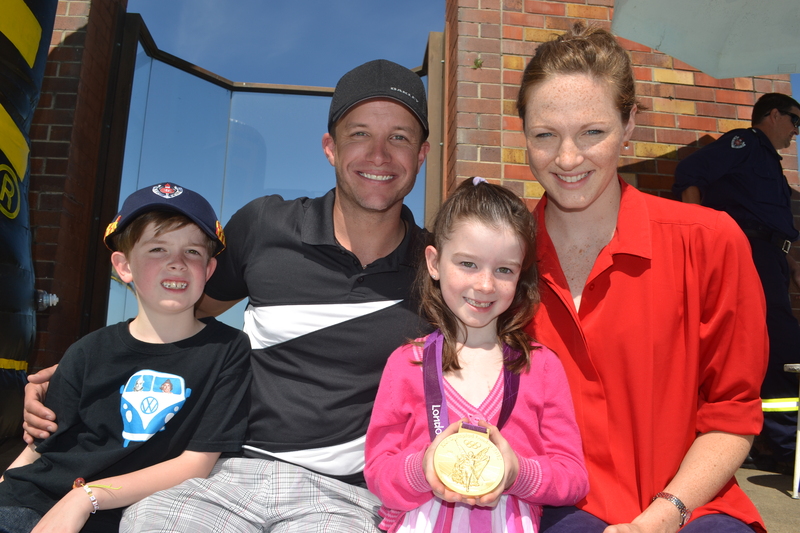 The kids with Kate, Luke and the gold medal. 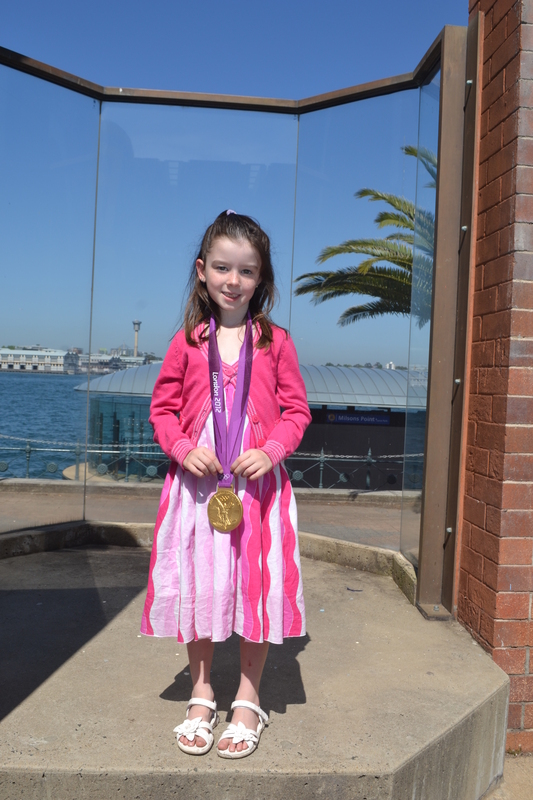 Thirdly, Cate Campbell shared her precious Olympic Gold Medal (or “mettal” as Miss called it) with us. It was only when I arrived home and was talking to my husband, Geoff, that the enormity of that hit me. The kids were able to wear the medal round their necks. When I was a kid, I wasn’t even allowed to touch Dad’s good crystal wine glasses. They were very, very precious. Yet, Cate trusted my kids, complete strangers, with her very precious, irreplaceable Olympic gold medal. This wasn’t just some plastic replica you find at the $2.00 shop. It was the real thing. That was very, very nice! Miss with the gold medal. Cate also spent time with us and I must say I enjoyed watching her swim. She took freestyle to a whole new level and had something like the grace of a swan. Needless to say, it was quite a different experience to what I’m used to at swimming lessons! Fourthly, a fireman drove my car across the Sydney Harbour Bridge and into the Sydney Fire Station. I always feel a bit silly about my nervous driving even though I am spatially challenged. However, I was able to voice my concerns to MDNSW who sent Kags along as navigator. But then a fireman offered his services so how could I resist? I decided that driving home across the Harbour Bridge would be a better time to extend my driving prowess. As it was, because the fireman was driving, we ended up at the tail end of the street parade featuring the beautiful historic fire engine. It was quite exciting being part of the action. Fifthly, the firies gave the kids caps and toys. This might not sound like much but it meant the world to the kids. Mister was given a cap from the Sydney Fire Station, which is almost glued on his head. He loves it!! He even took it to bed with him. He was also given a patch from the Northern Territory. Miss was given a cap from the Tasmanian Fire Service, which was very special because Geoff comes from Tasmania. A firey from Brisbane’s Roma Street Fire Station gave each of the kids a fire fighting koala bear called Blazer. They love him. We have also been invited into the Roma Street Fire Station when we’re in Brisbane next and hope to get there in January. There were other gifts, I’m sure. The kids were spoilt! It’s now Monday night and that fire brigade cap is still glued to Mister’s head.. This morning when I dropped the kids at school, one of them piped up in the car and said: “we are the luckiest kids in the whole wide world.” That’s what being nice does. It builds people up. Helps them feel good and makes the world a better place. In a world where being known as a “hater” in some circles is cool, I’d much rather be “nice”. If you enjoyed this post, I recommend reading my previous post The Love of A Stranger. If you asked me how things are going, I would reply “unbelievably good”. After such a fabulous day, my feet have barely touched the ground. It was so fantastic on so many fronts that I’m almost stuttering trying to get everything out. On Friday, the kids and I went to the finale of Fill the Boot, a national fundraiser for Muscular Dystrophy run by the fire brigade. My auto-immune disease is a neuro-muscular condition and we receive support and much encouragement from Muscular Dystrophy NSW. The Sydney Harbour Bridge and the big boot. The kids and I headed off to North Sydney Olympic Pool. To be honest, I wasn’t quite sure what was happening. I was mainly interested in the next part of the day… having lunch and a tour of the Sydney Fire Station, Australia’s oldest fire station. I have loved fire engines ever since I was a kid when my brother and I wandered out of our grandparents’ home to visit the local fire station around the block. However, the action at the pool exceeded my expectations. 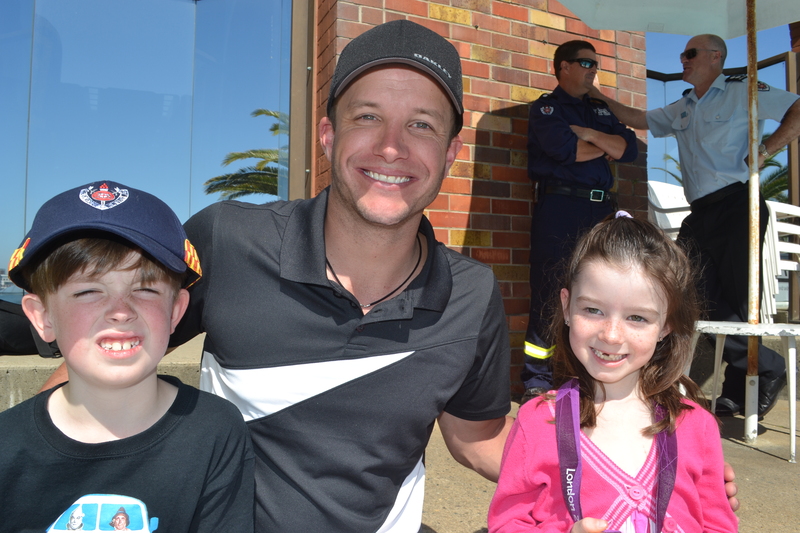 You see, the event was hosted by Luke Jacobz, Host of the x Factor. Now, I’m not one of these celebrity worshipping types so going somewhere just because someone famous is turning up, isn’t my scene. However, Luke turned out to be really lovely. We met Luke by the pool and it was all very casual and low key. He was wearing a gold Olympic medal round his neck and me being me, mistook him for an Olympic athlete. Good one Ro! The gold medal or “mettal” according to Miss, belonged to swimmer Cate Campbell who was a member of the team who won gold in the 4 x 4 100 Metre Women’s Freestyle Relay at the London Olympics. We had the opportunity to meet Cate and the kids were each allowed to wear the medal around their necks, which was such an amazing privilege. The enormity of that only sunk in once we met up with Geoff. 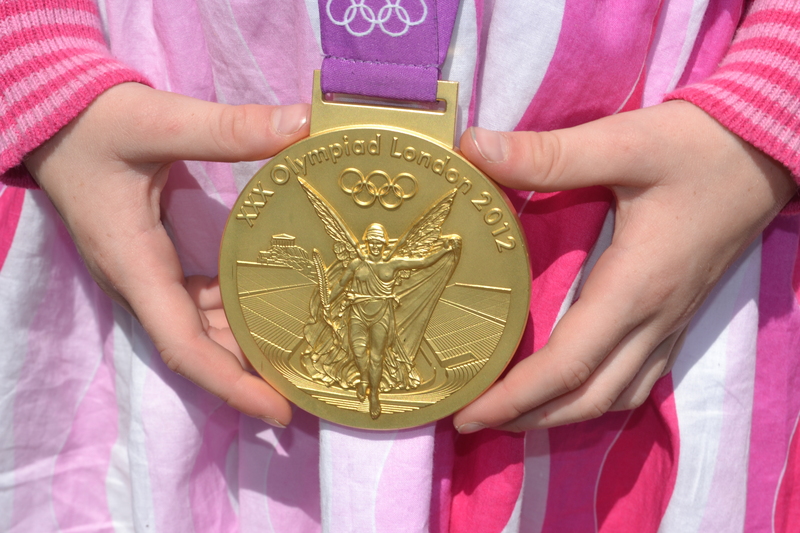 Most of us don’t get the chance to even see a real Olympic gold medal let alone touch one. Moreover, when you’re a kid, you’re constantly being told not to touch just about everything, so it was very special they could touch something so precious!! Thank you Cate! I of course was too busy photographing the medal to wear it myself but it was amazing. The kids had a ball! Kags from Muscular Dystrophy NSW was playing with them giving them piggybacks and spinning them around and they also spent quite a lot of time with Luke Jacobz who heard all about Miss’s tooth falling out and about how she’d even found fairy dust on her fingers. Luke was fabulous with the kids and so genuinely kind and very attentive. He is just one of those fabulous people you enjoy being around. I couldn’t resist getting my photo taken with him when he had his shirt off. This is what Mum does when she goes to Sydney! I have the x Factor! The relay was fun. 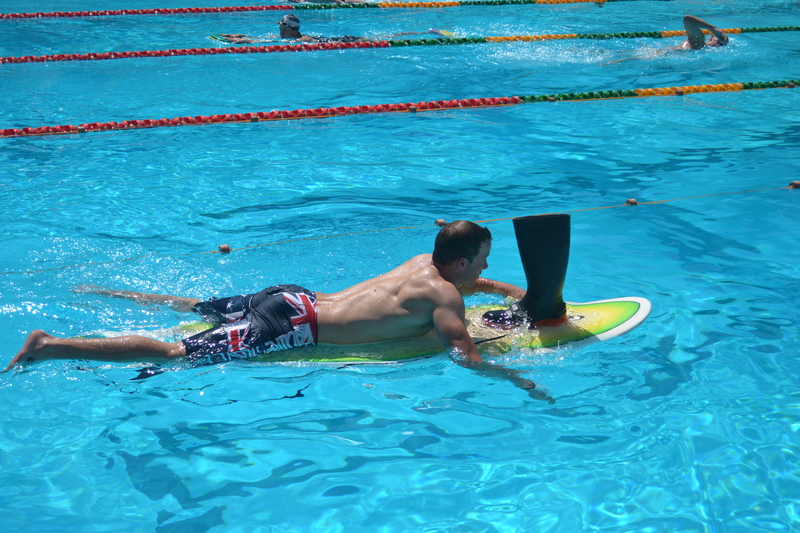 The firies, Luke and Cate raced in the pool with the boot on a surfboard. You know, Luke almost kept up with Cate but something tells me that she might have been taking things a little slower than usual. Cate also did a demonstration swim. That was pretty amazing. I’m not into swimming but her stroke was quite beautiful! The kids were pretty good but Miss literally had to test the waters. It was a really hot, sunny day and I shouldn’t have been surprised that she ended up in the pool but did she have to immerse herself fully dressed? One minute, she was as pretty as a picture wearing the beautiful pink dress Grandma had bought her and the next she was literally dripping wet right when we were about to leave for the lunch. I was gobsmacked. I could just see the Fire Commissioner being thrilled about puddles on the floor of his historic Sydney Fire Station. Drip! Drip! Drip! Fortunately, the dress somehow managed to dry off by the time we arrived. Speaking of getting to the lunch, I did have grand plans of driving us over the Sydney Harbour Bridge. Anyone who has been following my blog, will know that driving isn’t my thing and anyone who knows Sydney, knows that the Sydney Harbour Bridge is the great divide. I’m not the only one who avoids driving over the Bridge. As it turned out, one of the firemen drove my car in for me. I felt very relieved and the car even ended up at the tail end of the Fill the Boot street parade heading up Bathurst Street. That was awesome. There was the historic fire engine up the front with Luke and Cate on board followed I think by a few fire engines, a Police car and then us in our blue Pulsar with the fire man at the wheel. It was a hoot!! The kids were given the royal treatment. They were each given fire caps. Mister’s came from the Sydney Fire Station crew and he was given a shoulder patch from the Northern Territory and Miss’s cap came from Tasmania. 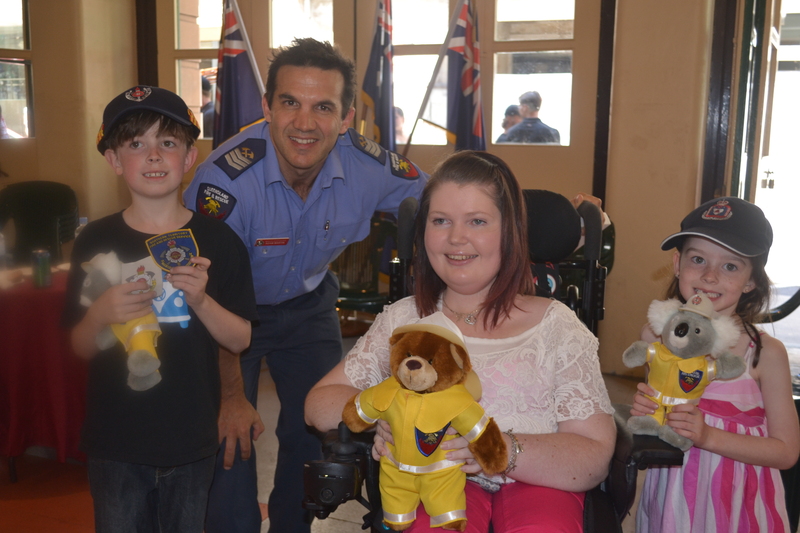 They were each given a soft toy fire fighting Koala called Blazer from the Roma Street Fire Station in Brisbane. They loved all their gifts! Mister has barely taken the cap off and even took it to bed. It’s almost become grafted to his head. 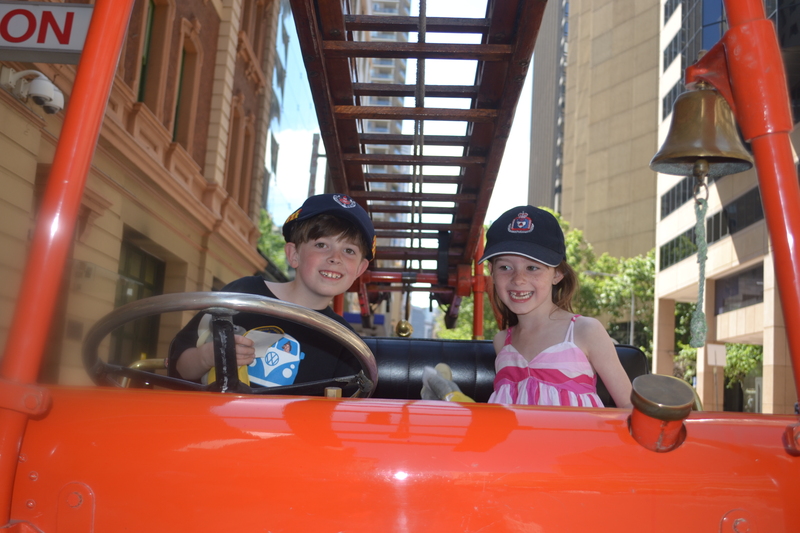 The kids driving the historic fire engine. They also spent considerable time “driving” the historic fire engine which was parked out the front at the lunch. They had a ball. A fire engine is always hard to beat. As the event drew to a close, we were given a personal tour of the fire station and we were even taken upstairs and shown the basketball courts and the gym. 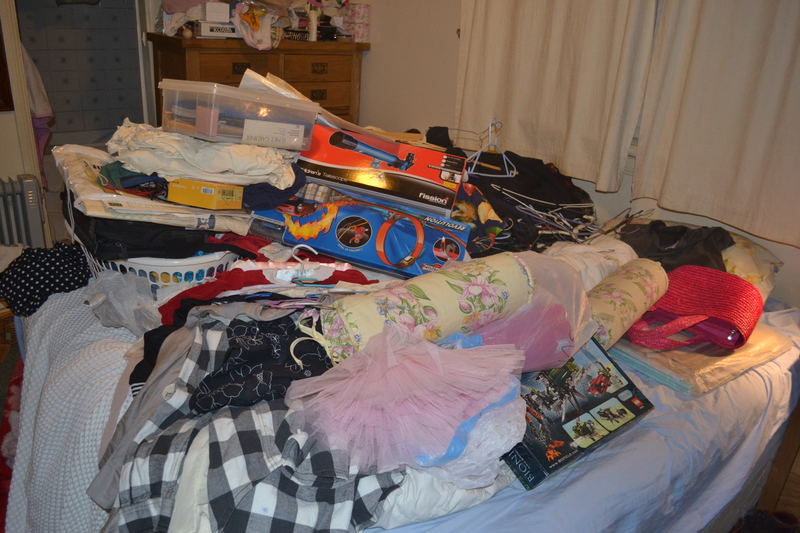 The kids wanted to see where the fire man slept but he said his room was a mess. 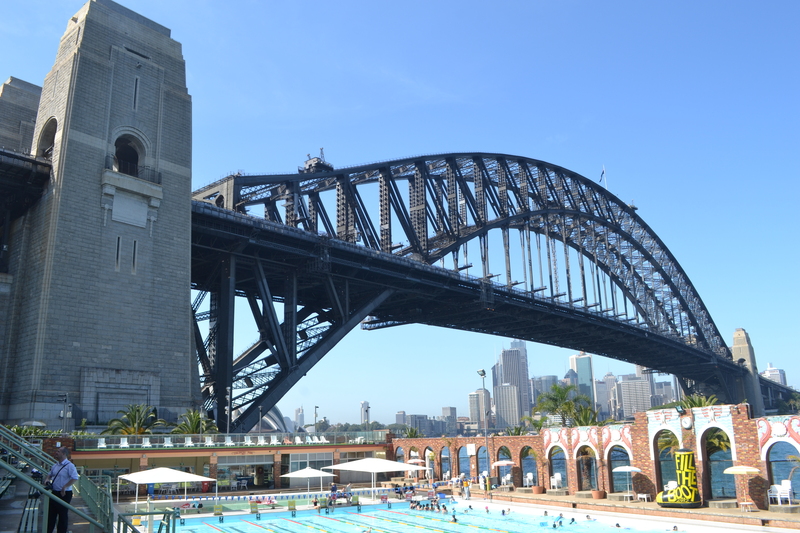 Lunch over, it was time for my next big driving challenge…taking on the Sydney Harbour Bridge. Of course, it was easier driving home and it is a trip I’d done a lot many years ago when I lived in the city. Still, it has been more than ten years since I’ve driven over the Harbour Bridge so I was pretty chuffed. The kids congratulated me as well! It was a most perfect day! Thank you from the very bottom of my heart! PS When I was dropping the kids at school today with their fire hats and photos for news, they said “we are the luckiest children in the whole world!” Isn’t that awesome! Happy Gappy…when the tooth finally falls out. The tooth saga is finally over. Well, at least, there’s a gap in proceedings… a much bigger gap than I’d ever anticipated. You could almost drive a bus through it! Our daughter’s first top tooth fell out yesterday. She’d already lost her two bottom teeth do but they’re not the same. The two front teeth are the real trophies! The conversation then turns to how many teeth they’ve lost, the same way they used to ask: “How many are you?” when they were back at pre-school. The more teeth you’ve lost, the better your status. 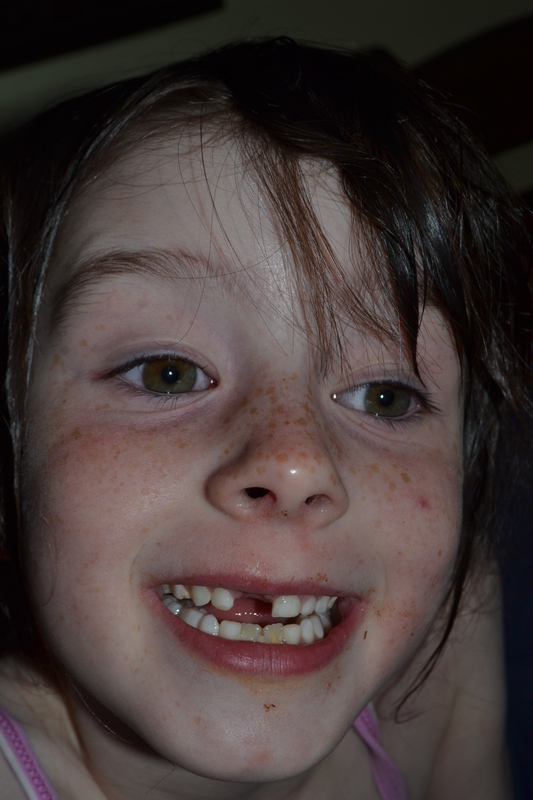 So of course, our daughter was over-the-moon excited when the tooth finally fell out. I, on the other hand, coped better than expected and didn’t have the anticipated nervous breakdown. I’m also really proud of myself because I didn’t shriek: “my little baby has gone” in the middle of the school playground where the tooth fell out. Part of me wanted to. The part of me which also wanted to superglue that rogue tooth back into position and let my daughter be little for just awhile longer!! You see, that cheeky grin with the baby teeth…that’s my girl! For better or worse, that’s life. Things don’t stand still. There is constant change, evolution, growth and I’d be the first to complain if she was somehow stunted. 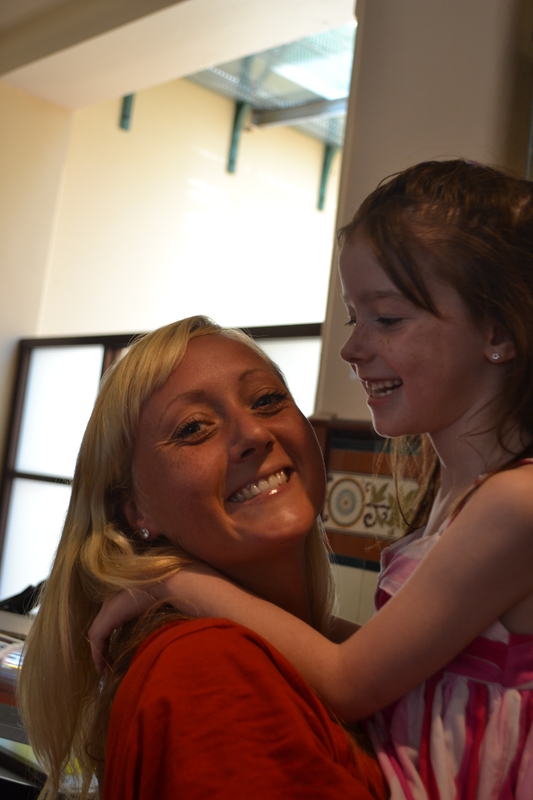 Besides, my daughter’s excitement is rather contagious! 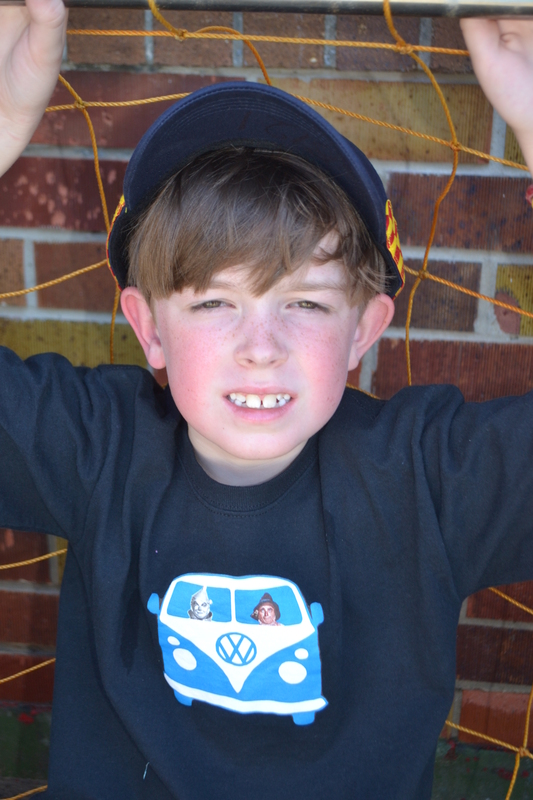 Losing your baby teeth is as much a part of growing up as learning to ride a bike, pimples and learning how to drive. At the tender age of six, our daughter has already been on her first date. Been there done that! I probably sound like one of those mums who’d like to pause their kids somewhere in the pre-school years. However, I’m actually pleased and indeed relieved that our kids are at school and more independent. I want them to grow up… not quickly but in their season. At the same time, there is something almost magical about those baby teeth. Me being me, I can’t help wondering… if Peter Pan could keep his baby teeth, why not our daughter? Once those teeth fall out, the line in the sand has been drawn. There’s no way back. Your child is onto the next chapter…no longer your “baby”. On the other hand, if those baby teeth didn’t fall out, there wouldn’t be a tooth fairy and the tooth fairy is so much fun! Of course, the tooth fairy was quite a topic of conversation yesterday. Our daughter is a smart little cookie…an investigator who calls herself a scientist. She asked me whether the tooth fairy was real or just pretend. I didn’t know what to say but I didn’t want to break the magic any sooner than I had to. So I used an old strategy. I answered a question with a question and turned the tables back on her. I could almost hear her mind ticking over and her mind ticks very, very fast. I don’t know whether she set a fairy trap or not but $5.00 appeared this morning and she announced at breakfast that her $5.00 note had a special fairy wand on it. We hated to disappoint her but this was just an anti-counterfeiting feature and not a fairy wand at all. She also mentioned that she found fairy dust on her as well. Tonight the discussions continued. She wanted to set up a camera to photograph the tooth fairy. My very quick-thinking husband quickly intervened and told her that no one has ever seen the tooth fairy and it explodes or disappears if anyone catches it. He didn’t want to mention the beer fairy ad but that did provide a bit of inspiration. Even after all this hard work, the tooth fairy’s days are looking numbered…a bit like the rest of those precious little baby teeth which are now hanging precariously, wobbling away with very enthusiastic assistance! Meanwhile, it looks like our happy gappy could use a set of false teeth. All these gaps might look rather cute but it’s difficult to eat. She looks like she could actually use a few false teeth to help her eat. It looks like she’s going to be a happy gappy for some time to come! I guess she’ll be singing all I want for Christmas is my two front teeth! This entry was posted in Parenting, Uncategorized and tagged acceptance, childhood, growing up, kids, mum, parenting, teeth, tooth fairy on October 11, 2012 by Rowena. 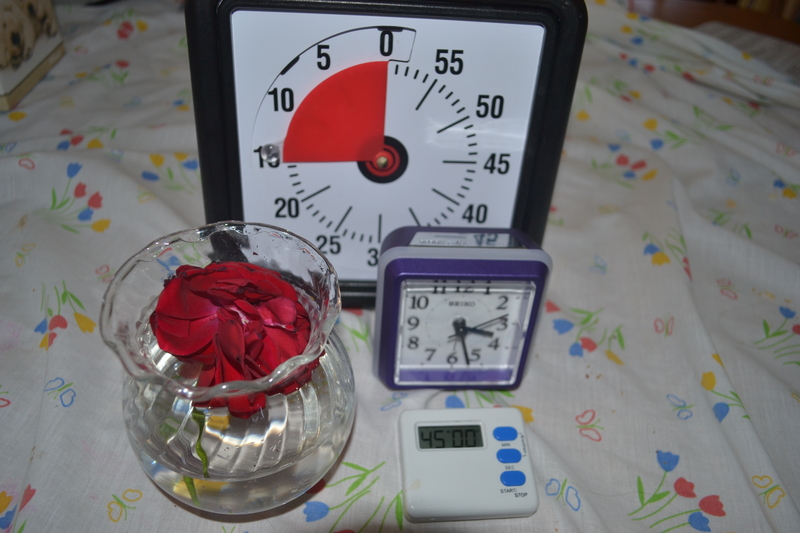 Our kitchen table ready for action…two timers and a clock along with the rose from my son. With two new additional clocks in the kitchen and two timers, I am now officially alarmed and dangerous. Indeed, our place now has so many clocks and timers that it’s starting to look like an international airport. Well you might ask why I’ve gone to such ridiculous extremes of time management. In fact, this is no longer time management. It’s time-control! Well, desperate times call for desperate measures. It’s not that I’m about to embark on some amazing journey trekking across multiple time zones or anything that time-challenging. All I’m trying to do, is drive the kids to school but this term we’re going to be on time! For some reason, the wheels fell off last term and this most basic of daily tasks eluded us. We were late almost every day and it was becoming quite evident, that we were in a time-zone all of our own. I’d make a few jokes with my friends and it was almost funny except the school keeps track of this sort of thing. Further up the food chain at the Education Department, there is some sort of scary inspector-type person who’ll soon come knocking on my door. I don’t know what sort of mystical powers this person might have but it can’t be good. No one wants to attract this type of attention. So you could say, it is time or even past time to sort ourselves out! I know it’s going to take a revolution to get there and I am prepared…well almost. You see, I’ve now realised that change isn’t just about setting goals. You need to work out how you are going to implement them. Then, you need to act or at least get started. This is particularly challenging when you’re trying to overcome a weakness and I’ve come to understand that just adding my weaknesses to my to-do list simply isn’t enough. I need specialised strategies and tactics to succeed, even for such a seemingly simple task as getting the kids to school on time. I say seemingly simple because in our household getting out the door is difficult enough and being on time is major nervous breakdown material. That’s where the weapons of mass destruction come in. It’s going to take some serious dynamite to get things to change around here. That’s because we have three people of mass distraction in our family and we’re all wandering off in different directions with different distractions. To get the ball rolling, I’ve put a bomb under myself. That’s what I’d call making this type of announcement on my blog with the entire World Wide Web as my witness. If I write it on the blog, I have to do it. It’s a credibility thing. I’m mean, how is that for accountability? Pretty good, I reckon! This could be just the right kind of dynamite I need to get moving. Go Ro! Go! You could well ask what goes wrong every morning. You would also probably suggest that we just wake up 15 minutes earlier. But we already get up early. That’s not the problem. You see, Geoff is up at 6.00 and the kids are up by 6.30 and I’m up at 6.45. We don’t need to leave for school until 8.55 AM so it’s not as though we are sleeping in. I actually suspect that we have too much time on our hands and that’s our problem…too much scope for veering off course. Things start out pretty well every morning. Geoff gets the show on the road. He is quite focused and has a very definite routine. Our whole strategy each morning is to get as much done as possible before he leaves for work. Geoff generally gets breakfast underway before I stagger out of bed. We are now ensuring our son is dressed BEFORE breakfast. If he isn’t dressed before Geoff leaves, things get ugly. Add our daughter to the mix and I guess that’s how you get the phrase “double-trouble”. Moreover, heaven forbid I might actually need to get something done or need to get to work before midday. The kids are usually pretty close to being dressed and fed when Geoff leaves so what goes so horribly wrong? I’ve had the kids get undressed. I’ve had Miss arrive at school without her shoes on and they’ve each left their bag at home before. They’ve chased poor unsuspecting skinks and white cabbage butterflies. They’ve lost shoes and played on the computer. The list of distractions is endless. If only they’d stuck to the rules like that at home, we wouldn’t have been late in the first place! Getting the kids to school on time is also much more difficult than anything I’ve ever faced in the workplace. I am managing two non-compliant sub-ordinates and I can’t just fire them when they refuse to cooperate. As much as all that Anthony Robbins motivational stuff is great if you actually get around to reading it, it’s quite a challenge trying to motivate someone who is so determined to work against you or is running their own race. You could say that it’s my job to train them. However, I am actually concerned that I might have trained them a little too well! You see, I get rather distracted myself. It starts off with the blank, zombie stare out the window until my coffee kicks in. Then I have been known to write the occasional song or come up with a few ideas for my blog, which are hastily scrawling on scrap paper and filed for later. Sometimes, I must confess that I might have kept writing and writing and writing. It’s a bit of a bad habit but when you get into the flow, you can’t just turn it off. It doesn’t work like that. What if one of those ideas just happens to be the big one? Writing is like fishing. You’re always trying to catch the big one! The one which is going to transform you into some incredibly amazing literary genius! Unfortunately, many of these good ideas also get away like the fish! This writing game is not without its challenges! That’s all well and good but flights of fancy aren’t going to get the kids to school on time. As much as I love my writing, I have to live in the real world too! This is why I’ve become alarmed and dangerous. Setting goals is no longer enough. The bigger question is: how am I going to make this happen? I can see some of my friends smiling already. They know just how incorrigible I am…a recidivist, repeat offender. They’re right but as I said desperate times call for desperate measures. As I acknowledged in a previous post, too often I’ve failed to do what I know I should be doing and it’s now time to stop shooting myself in the foot and to start making some changes. I have found this timer extremely useful myself. It’s helped me realise that time is finite, fixed and you can’t just squeeze more time into time. It’s not like trying to fit in that second serve of Christmas pudding and custard after you have thoroughly gorged yourself on Christmas Day. Time is fixed and completely inflexible. Once you’ve used up your time, you can’t get it back. Ask for a refund. It doesn’t work like that. 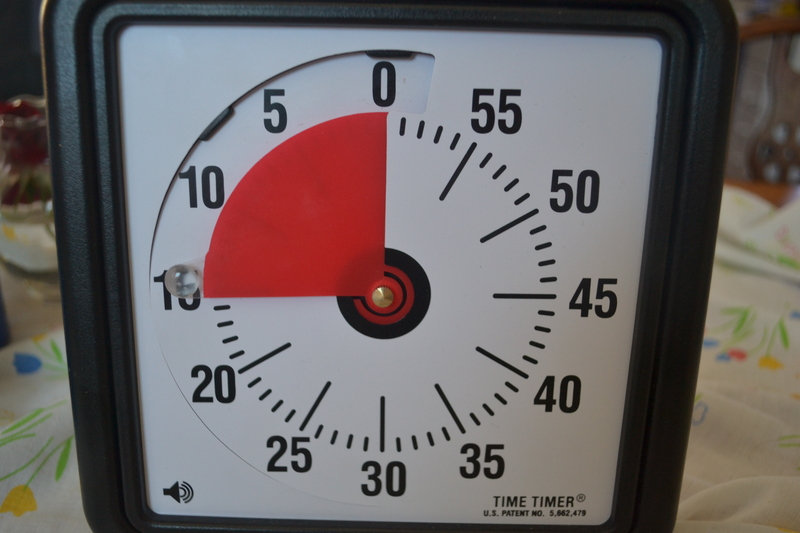 I have found the timer particularly useful for doing my violin practice. Initially, I just set it for the half an hour but then I was able to realise that my piece had three sections and I needed to break that down into 10 minutes each and then I need to play the piece as a whole though a couple of times as well. That meant, I actually need to practice for 40 minutes. I don’t think I would’ve broken the time down like that without that visual element I now get with the timer. It’s been very insightful. 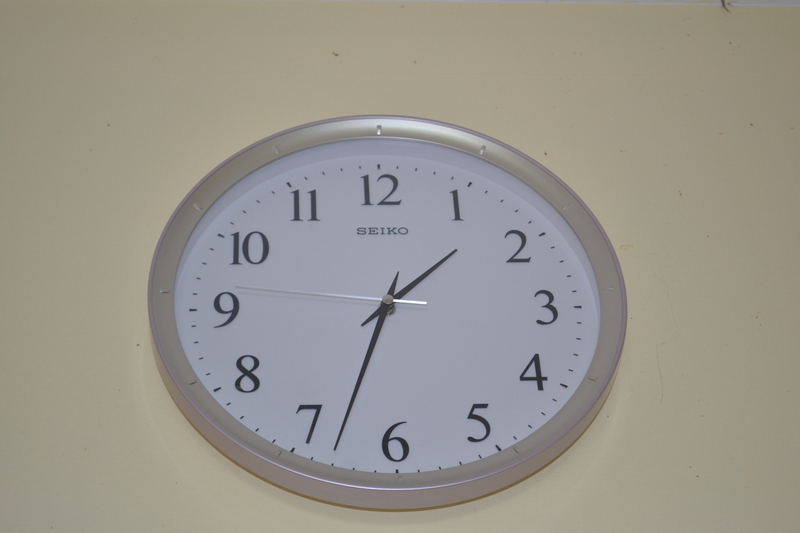 Secondly, I bought a big railway-style analogue clock which is clearly mounted in the kitchen. This is as close to a flashing, neon sign as I could get without making the place look like some cheap rent by the hour motel. It is quite stark and easy to read at a glance with the numbers written on it and it has hour, minute and second hands. It’s all very straight-forward so I can track time easily and the kids can also learn to tell the time as well. Previously, I had been largely dependent on the digital clock on the kitchen microwave for keeping track of time in the mornings. What I have discovered, however, is that digital clocks do not teach children the concept of time or the concept of time passing. This is much more obvious on your old fashioned clocks with the hands ticking away where you can see how long 15 minutes is. That becomes even more obvious with the visual timer. You might think this is a pretty serious commitment to time management but wait! There’s more! I’ve also bought a little analogue alarm clock to go on the kitchen table. We can refer to this while eating breakfast and doing homework. The beauty of this little alarm clock is that the light flashes on and off when the alarm goes off. I can set the alarm for five minutes before the kids are due to go to school and press the snooze button for that final reminder. I am starting to look so good. I’m so organised, it hurts! The clocks and alarm will keep track of time but we also needed a routine, a list to keep us on track. Actually, we already have one. We just need to use it. I have a list of all the kids’ tasks with a column for each day next to each task and they have to tick it off. This check-list ties in with their pocket money. They get $1.00 per day for doing all their jobs and we only doing it during the week so when they do everything, they get $5.00. Goals for the kids…shame the laminating machine munched it. 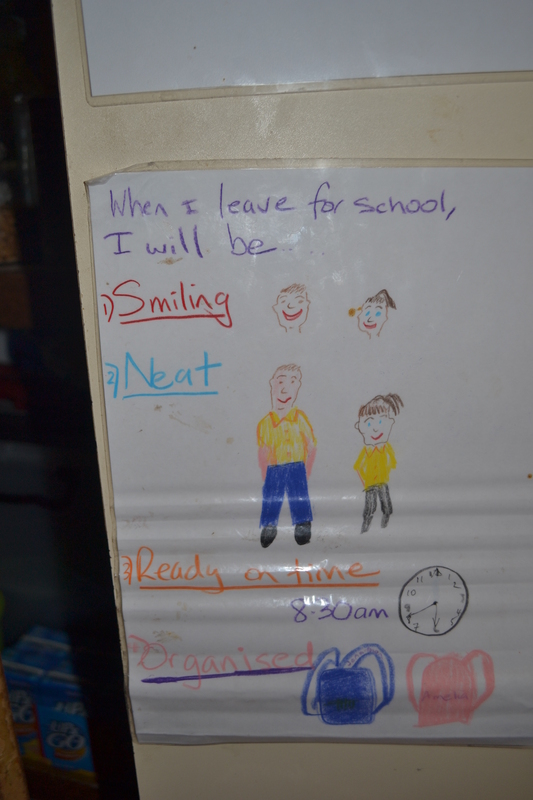 Like getting to school on time, the morning routine seems pretty straight-forward but we derailed there as well. I had the routine glued into a book so it could move around the house as they did their jobs but then we’d lose the book. I also found it difficult to know quite how to handle non-compliance. How much pocket money should I deduct if they don’t make their beds or should that be something in time out? After awhile, the system that had been working quite well, stopped. It didn’t stop altogether but it’s been on life support for well over a year now, despite a couple of resuscitation attempts! We need to get the routine back on track. This time, I’ve decided to mount the chart on the kitchen cupboard. That’s where we keep our time out charts by the way. This is all starting to come together well and even I am feeling cautiously optimistic. At least, I was until someone mentioned that daylight savings starts today… the day before school goes back. I’m sure it’s a conspiracy! Speaking of other challenges, the healthy eating plan kicks off on Monday again too. I’ve actually been doing fairly well on that front so no real huge changes required there. Despite being on 50 mg of prednisone for 3 months, my weight has stayed the same so I’m pretty stoked. I’m doing this more for my health than to lose weight. However, I have been advised to lose more weight to help with my breathing and digestion. I’m hoping to lose 3 kg before Christmas. I go back to Tai Chi on Wednesday too. My goodness, it’s looking like a big week and it all starts tomorrow! Tomorrow, tomorrow, it’s only a day away! PS: Tomorrow hasn’t even arrived and as usual catastrophe has struck or should I be positive and call it a “setback”? No, that’s such a euphemism. I’m just hoping it’s not a sign of what’s to come in the morning. I was unpacking my summer clothes and just about to tackle my wardrobe when the screws holding the rail mounting burst from their seams and my entire wardrobe collapsed. This all happened at 8.30 PM. Can you believe it? Having to unpack my entire wardrobe the night before D-Day? The night before school goes back?!! I’ve spent most of the day packing up the kids’ winter gear and getting out the summer clothes and I just needed things to flow smoothly without any hiccups. My mother says we were born under an unlucky star and I tell her she’s got it wrong but sometimes I have to wonder. Right now, I am feeling just a teeny weenie bit cursed!! Make that a lot cursed! Now, I know that it’s not just me shooting myself in the foot anymore! The results of a serious wardrobe malfunction! I am really starting to wonder whether Monday will ever come! Day one went exceptionally well and we were in the car ready to drive off at 8.30 AM. When we arrived at school, the place looked like it was just waking up…such a different landscape to the usual! Mr arrived home quite excited saying he had been to breakfast club at school with his best friend and how he was the third child in year 3 to arrive at school. He wants to leave at 8.25 AM tomorrow to be there first. This is such a complete turnaround from the kid I was dragging into the car at 9.00AM and did his best to make his sister for her school excursion. Miss was happy ticking off her checklist and is focused on the money. She wants her $1.00. As for me, I was back home by 8.45 AM drinking my cup of tea. It was such a different scenario to last term. By the way, we did have one hiccup. The time timer decided not to work. I tried everything such as changing the batteries and fiddling with the batteries and nothing helped. Geoff had it going tonight in minutes. I don’t think I quite had the battery in right. I’ve only had that timer for a week or so but I really missed it today. It makes it so much easier to keep track of time!! This entry was posted in Health, Parenting, Personal Development, Uncategorized on October 7, 2012 by Rowena.